The initial statement, posted on the presidential website, went too far in describing the results of a telephone call between the two leaders as having reached a cease-fire, said a spokesman, noting that a revised version would be posted shortly. The presidents exchanged opinions about a cease-fire, but there was no formal agreement, said the spokesman, who, in line with protocol, did not give his name. The change echoed statements from Dmitri S. Peskov, the Kremlin’s press secretary, who had earlier said that Russia could not negotiate a cease-fire because it was not a party to the conflict but that the opinions of the two presidents overlapped. “Putin and Poroshenko did indeed discuss steps which could facilitate a cease-fire between the militias and the Ukrainian military,” Peskov was quoted as saying by the news agency RIA Novosti. “Russia cannot physically agree on a cease-fire, as it is not a side in the conflict,” he added. They discussed “what should be done primarily to stop the bloodshed” in southeastern Ukraine, Peskov said, suggesting that the two leaders had found common ground. “The presidents’ viewpoints on possible ways to overcome the grave and critical situation coincide to a considerable degree,” Peskov said. Vladislav Brig, the head of the political department for the rebels’ Ministry of Defense in Donetsk, said in a telephone conversation that combat operations were continuing as usual. “Nobody is holding negotiations about a cease-fire with the representatives of the Donetsk People’s Republic,” Brig said. He echoed Peskov’s statements in saying that Russia could not negotiate for the rebels. “The conversation was about measures for a cease-fire,” Brig said. “Putin did not agree with Mr. Poroshenko about any cease-fire because Russia is not involved in this conflict.” Brig said that the rebel leadership had not met to discuss the statement by Kiev. Miroslav Rudenko, a member of the rebel parliament, suggested that the cease-fire might be a trick, but also suggested an openness to negotiations. “If the Ukrainian side will hold to their promises to cease fire, then we are prepared for a political side of the settlement,” he told the Russian news agency Interfax. President Obama said it was “too early to tell” whether the Ukrainian announcement would be meaningful. He suggested that the real test would be whether Moscow was willing to rein in the separatists and stop its military support for them. “If, in fact, Russia is prepared to stop financing, arming, training, in many cases joining with Russian troops activities in Ukraine and is serious about a political settlement, that is something we all hope for,” Mr. Obama said at a televised news conference in Tallinn, Estonia. 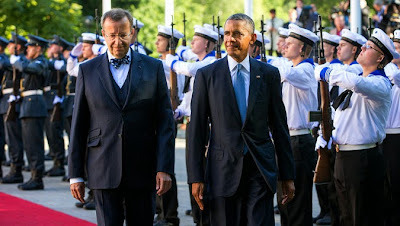 “We haven’t seen a lot of follow-up on so-called announced cease-fires,” Mr. Obama said after meeting with President Toomas Hendrik Ilves of Estonia. Mr. Obama’s comments came as he began a day of private meetings with Baltic leaders and of public statements meant to reassure fretful allies — particularly those bordering Russia — that the United States and Europe were serious about defending them from a newly aggressive neighbor. “There’s an opportunity here — let’s see if there’s follow up,” Mr. Obama said. “This is Russian aggression,” Mr. Ilves said of Moscow’s actions in eastern Ukraine. Mr. Obama’s stop in Estonia came on the eve of a NATO summit meeting in Wales where members are expected to endorse a rapid-reaction force capable of deploying quickly to Eastern Europe, their strongest response yet to the situation in Ukraine. Over the weekend, Ukraine and NATO accused Russia of sending troops and armor over the border. European Union leaders then discussed a new round of sanctions against Russia, the fourth, that could be enacted within a week. Russia has been escalating pressure on Ukraine, demanding that it grant some measure of autonomy to the eastern provinces of Donetsk and Luhansk, where groups of armed militants have been demanding independence. Until now, the administration in Kiev has been reluctant to engage in such talks, arguing that the separatists are a Russian proxy force who do not represent the feelings of most of the people in the east. But in recent days, the Ukrainian military has lost ground in the east. Ukraine has said that the reverses were a result of the direct intervention of the Russian military. Russia continues to lie, and denies sending men and arms across the border. A shaky cease-fire reached in June between the government and the separatists collapsed after 10 days. Putin and Mr. Poroshenko met in Minsk, Belarus, last week, but no results were announced from that meeting, and the separatists opened a new front along the coast of Ukraine within days. I wounder if Washington has any legal basis for considering pro-Russian separatists as terrorist organizations?